Johannes BRAHMS: Seven Fantasien, Op. 116 (1891-2); Three Intermezzi, Op. 117 (1892)*; Six Pieces, Op. 118 (1892-3)*; Four Pieces, Op. 119 (1892-3) (rec. 1950*, 1953). 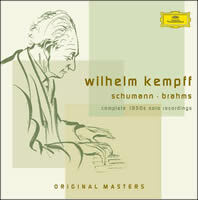 CD 4 in “Wilhelm Kempff Original Masters: complete 1950s solo recordings.” Deutsche Grammophon 474 393-2 (5 CDs) (http://www.deutschegrammophon.com/). Deeper than his 1963 redo. Kempff’s fabled accents and shadings here mark an indelible 117/1 or 118/5. Cutting attacks also figure in 119/4. Johannes BRAHMS: Seven Fantasien, Op. 116 (1891-2); Three Intermezzi, Op. 117 (1892); Six Pieces, Op. 118 (1892-3); Four Pieces, Op. 119 (1892-3) (rec. 1962-65). 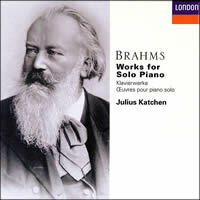 CD 4, 6 and 5 in “Brahms: Works for Solo Piano / Julius Katchen.” London 455 247-2 (6 CDs) (http://www.deccaclassics.com/). London uses these as filler. Not Katchen: His Innigkeit presses harder than Kempff’s, and he links the heroic side movingly to Brahms’ past. Johannes BRAHMS: Two Rhapsodies, Op. 79 (1879) (No. 1*, No. 2); Three Intermezzi, Op. 117 (1892)*; Six Pieces, Op. 118 (1892-3); Four Pieces, Op. 119 (1892-3) (rec. 1970*, 1976). Radu Lupu (pno). Universal Japan UCCD-50081 (http://www.universal-music.co.jp/classics/). Purchased from CDJapan (http://www.cdjapan.co.jp/). 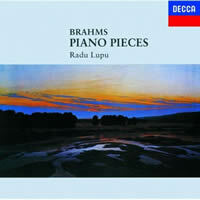 Aided by superb remastering, Lupu can float melodies in indecently gorgeous fashion. No wilting implied; energy and defiance aren’t lacking. Johannes BRAHMS: Seven Fantasien, Op. 116 (1891-2); Three Intermezzi, Op. 117 (1892)*; Six Pieces, Op. 118 (1892-3)**; Four Pieces, Op. 119 (1892-3)* (rec. 1968*, 1981**, 1983). Stephen Kovacevich (pno). 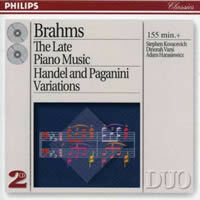 CD 1 in “Brahms: The Late Piano Music / Handel and Paganini Variations.” Philips 442 589-2 (2 CDs) (http://www.deccaclassics.com/). Each opus number convinces, but the whole covers a 15-year span. The back-and-forth between early digital and 1960s analog gave me whiplash. Johannes BRAHMS: 10 Intermezzi for Piano (1878-93) (rec. 1960). 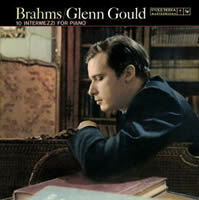 Glenn Gould (pno). Sony BMG 88697147602 import (http://www.sonymusic.de/). Purchased from Climaczuk, York, U.K. (http://myworld.ebay.com/climaczuk/). Immature (GG bragged of how fast he learned them), skewed yet illuminating, as in 116/4. His look under the hood stresses polyphonic events.